StayLock Perforated Tiles are a great, dry-surface, non-slip wet flooring tile. 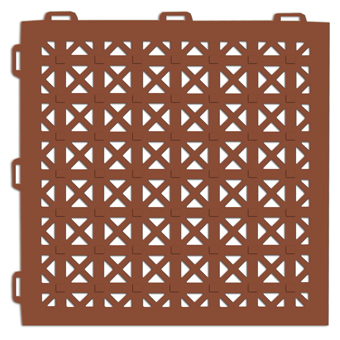 This 1×1 ft modular tile is made of soft plastic material and delivers traction and comfort on wet surfaces such as patios, spas, pool surrounds, rooftop decks, and shower floors. They can also be used in dry areas such as industrial locations, greenhouses, locker rooms, and standing work stations. They are also great for decks and rooftop areas. The material for StayLock is specifically designed for outdoor installations and features a 7-year UV stable colorant and anti-fungal additive. Safely install this for institutional outdoor swimming pools and spas or hot tubs. StayLock perforated non-slip floor tile easily connects together with a tab locking system that will not allow the tiles to separate over time. This non-slip flooring solution is available in a variety of appealing colors for indoor and outdoor applications. This modular, perforated floor tile is perfect for pool and spa surrounds because it’s easy on bare feet and durable for tables and lawn chairs. The top surface of this non-slip tile will provide traction when wet as well as comfort and fatigue relief for standing and walking. Use this modular non-slip floor tile for industrial applications where workers may be exposed to a wet floor. This tile will provide an anti-fatigue benefit for people standing for long periods of time. This PVC tile is naturally resistant to oils, acids and toxic chemicals. StayLock perforated non-slip floor tile easily connects together and does not require any glue for installation. Easily cut this modular perforated tile with a sharp utility knife for wall-to-wall installations or to install around poles, table legs, or other obstacles on the floor. StayLock perforated non-slip floor tile easily connects together with a unique tab locking system that will not allow the tiles to separate over tile. These modular non-slip flooring tile can also be separated and taken up easily if needed. Consider an aesthetic designer look with colors of terra cotta, forest green, or aqua blue. This non-slip floor tile can be custom ordered in virtually any color desired. All colors are made from virgin PVC material. Black is made from material with a low percentage of recycled content.